Manufacturer Refurbished - Comes with Remote Control, user manual and mains lead if applicable only (Coffee machines etc not included). Other accessories (batteries/cables etc.) may NOT be supplied. 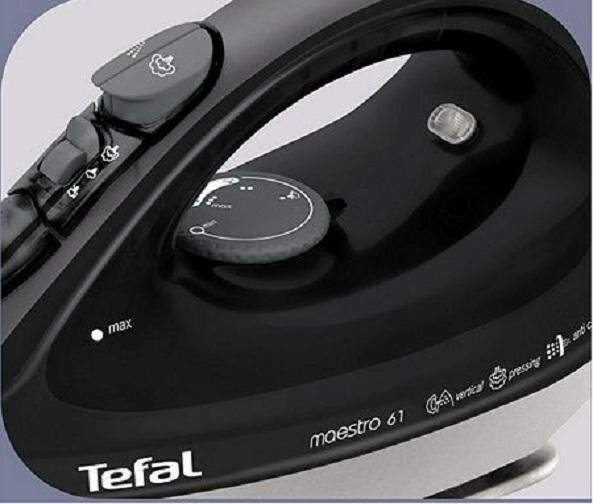 The Tefal Maestro FV3761 Steam Iron Comfort Handle Double Anti Calc is a great appliance, built with both great functionality and a sleek design. 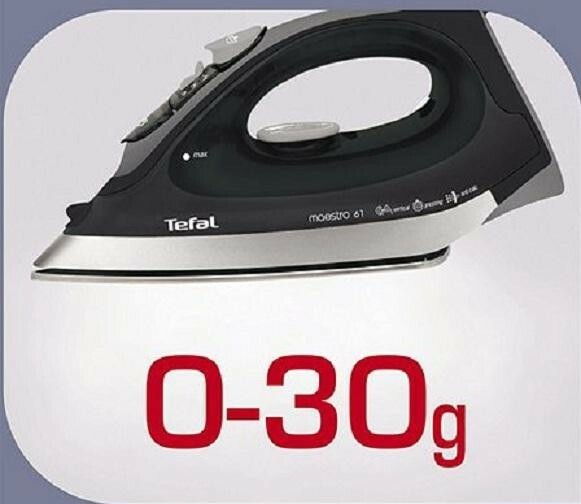 The Tefal Iron comes with a generous 300ml Water Tank, which will save you a lot of time and energy constantly filling it up. 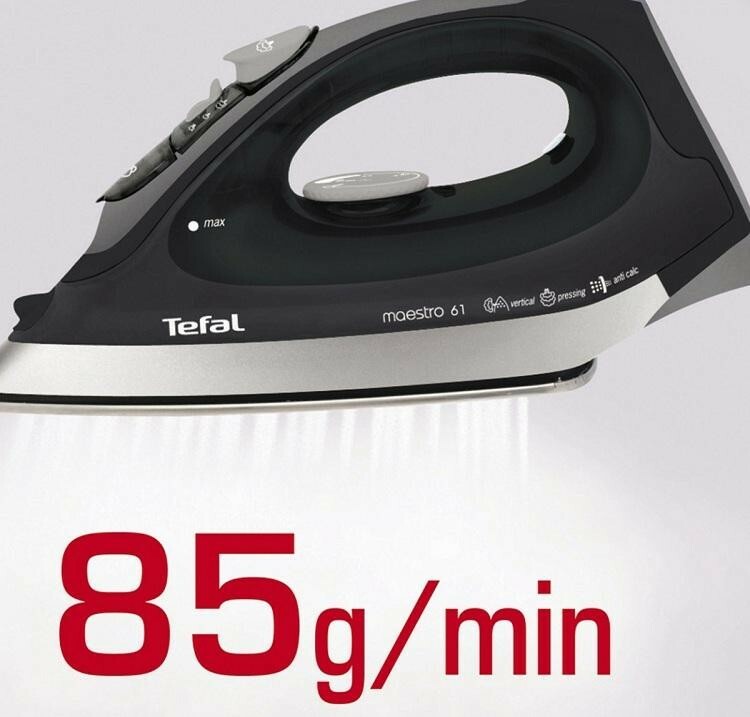 The Built in Double Anti Calc system and Self Cleaning functions of the Iron ensures long lasting performance, and a perfect iron anytime you need it. The 2.5m Cord is great if you only have a narrow space to work within or if your old iron could never quite reach the plug sockets in your home. In addition, the Iron also has a specially designed Comfort Handle, which is ergonomically designed to perfectly rest in the palm of your hand, letting you glide effortlessly over all of your clothes. All of our orders are shipped via DPD or Royal Mail 1st Class/1st Class Recorded (except Plasma's and over 46" TV's which are shipped via a specialist courier). Please ensure you have an up to date daytime contact telephone number, preferably a mobile telephone number, on your account should we need to contact you about your delivery (see below). We aim to ship orders within 2 Working days; most orders are shipped on a next day basis (Plasma and over 46" TV's are shipped via a specialist courier and may take 3-5 working days to be delivered). You will receive a despatch notification email containing your tracking number when your item is despatched, (no tracking number provided for large screen TVs). Delivery of your item will take place between Monday-Friday and between the hours of 09:00am-5:30pm and must be signed for at the registered Paypal address, it will NOT be left in safe places or with neighbours. For orders delivered via DPD, deliveries will be attempted twice, with a calling card left each time. If the item is returned to us as a failed delivery after 2 attempts, the order will be cancelled and refunded once we receive the item back. A Fee of £10.00 may be charged for any further delivery attempts. Large Screen orders will only be attempted on one occasion. You will be contacted prior to the delivery to arrange a suitable time. If this delivery fails the cost of a second delivery attempt will be chargeable. If you would like to collect your item from our store then Payment must be made in person with a credit/debit card using chip & pin or cash on collection. Our address for collections is; Electrotec, Manchester Road, Hollinwood, Oldham, OL9 7AA. If you have provided us with a mobile telephone number, DPD couriers will send a text message on the day of delivery advising of an approximate time slot for the delivery. If you have not provided us with a mobile telephone number, DPD couriers will send an email on the day of delivery to the supplied email address advising of the approximate time slot for delivery. Please note any quoted time slot is approximate and does not guarantee delivery between those times. If you have provided us with a mobile telephone number, our large screen couriers will send a text message or call you to confirm the day of delivery. If you have not provided us with a mobile telephone number, the couriers will send an email or attempt to call the landline number to confirm the delivery date. On the day of delivery, the driver assigned to deliver your order will attempt to phone before 10am to inform you of the estimated 3 hour time slot for delivery. Please be aware the driver will attempt delivery on this day even if there is no answer to this call. Please be aware: If there is no one home to take delivery on the date agreed the courier will return the unit & a second delivery attempt will be chargeable. At Electrical-Deals we are committed to providing high quality products which we hope you will enjoy, but we know from time to time a product may need to be returned or exchanged, therefore all items come with a 12 Month Return To Base Warranty. You must notify us of your intent to cancel within 14 Working days of the date you received the item. please contact us on 0161-688-1542 or Email contact@electrotec-ltd.co.uk to request a refund and to obtain a unique Return reference number. If the item was originally delivered by Initial City Link / DPD / Specialist courier, Electrical-Deals will arrange a FOC collection at your choice of UK Mainland address, we reserve the right to ask you to return the item at your own cost for non-faulty items. If the item was delivered by Royal Mail or if you collected the item yourself then you will be required to return it at your expense via the same method. All return items must be in their original and unused condition, complete with all accessories supplied and original packaging. A full refund (including original carriage charge) of the order will be processed upon the items arrival at Electrical-Deals. Please contact us on 0161 688 1542 or Email contact@electrotec-ltd.co.uk to request a refund or a replacement and to obtain a unique Return reference number. If the item was originally delivered by Initial City Link / DPD / Specialist courier, Electrical-Deals will arrange a FOC collection at your choice of UK Mainland address. All return items must be securely packaged in the original packaging and complete with all accessories supplied. If you have elected to receive a replacement, then a swap out will be arranged at any UK mainland address of your choice. If you have elected to return the item for a refund, then this will be processed upon the items arrival at Electrical-Deals. If your item develops a fault after 60 days of the date you received it, but within the 12 Month warranty period we will offer a FOC repair upon receipt of the item. You are responsible (including costs) for returning the item to us via a trackable method. Please contact us on 0161 688 1542 or email contact@electrotec-ltd.co.uk to request a unique Returns reference number. Return the item to us at, Electrotec, Manchester Road, Hollinwood, Oldham, OL9 7AA. The item must be securely packaged, preferably in the original packaging using the inserts supplied. - We will not be held responsible for any loss or damages that occur whilst in transit. Upon receipt of your item we will provide a FOC repair including any mechanical parts, if in the unlikely event the unit is beyond economical repair we will provide a like for like replacement. When we have repaired your item we will return it to your choice of any UK Mainland address FOC and contact you beforehand. Our FOC repair service excludes cosmetic/accidental damage and customer misuse. In the event of an item being returned to us for these reasons we will contact you and provide an estimate for repair or ask you to collect the item from us at your expense. The above policies do not affect your statutory rights. contact@electrotec-ltd.co.uk Follow us for exclusive offers!